Cables and Lace Capelet was a pattern I wanted to knit as soon as I saw it. It had this Outlander/Scottish Highlands vibe and looked like it would be great to throw on as I walked out the door for yoga or coffee with friends. The pattern photo looked great. I walked into this one with my eyes wide open. There were a couple of red flags: The pattern was an older freebie and of the 15 finished projects besides the sample, virtually everyone commented on size problems, as in the finished project was way too small. One commenter said it fit her 10-year old. When my gauge swatch, properly blocked and all, revealed that I was going to have an extra 10" or so around, I figured that would make the fit just right. And, of course, I was wrong. It looked good finished and blocking. (Blocking tip: I no longer weave and clip my loose ends before blocking, they will stay in place more firmly and look neater if you wait until after you block. So you can see my tails hanging in various places). I was still a bit worried about the length, but I was delighted by how the lacework opened up and how good the stitch definition on the cables was. The biggest worry, though, was the collars. I had carefully knit them to pattern legnth, but upon wet blocking, the weight of the yarn seemed to urge them onward into expansion. They looked huge. I carefully patted them back into shape, but they insisted upon growing, no matter what I did. As it turns out, they're at least twice as long as they should be. And the shoulders too are overlarge. As you can see below, they slip off, instead of giving a nice snug fit. And I mentioned that the collar had grown ridiculously long, right? It's a horror show. 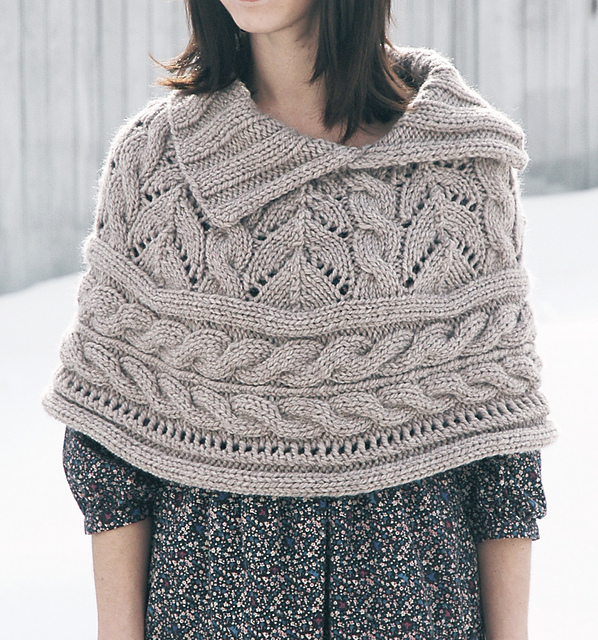 Despite these flaws, I love the capelet and I love the yarn (Madeline Tosh). And, I'm incredibly glad I didn't do the finishing work on the collar before blocking so that I can try to fix it. My dilemna is choosing among the two potential solutions I see. The yarn is superwash, so I could just pop it in the dryer and hope for the best. I've never done this before, but I know that it works in theory. My biggest concern doing this is that I'll lose length, which is perfect right now, as opposed to circumference, which is the problem. And, really, does anyone think that donkey ear collar is going to shrink enough? I should have known that a yarn this bulky would expand beyond what the swatch predicted. My Second option is ripping back to before the start of the collar, faking another lace repeat with reduced stitch count to give me a better fit in the shoulders, and then knitting a collar that is about half what the pattern calls for, knowing it will block out. This is probably the safer option and I'm leaning that direction. So what would you do, gentle knitters? Any advice about superwash yarns and the folly of knitters who don't trust the pattern and listen to what their gauge is telling them? At least future knitters for this pattern will know that in my case, the pattern was written perfectly and the proper gauge, properly blocked in the small size would have produced a perfect fit for my size medium body. Wash it again, or at least get it damp, and put it in the dryer for a few minutes. I had the same issue with my Featherweight cardigan in Tosh Merino Light and a few minutes in the dryer on delicate tightened it back up to my pre-hand-washed gauge. Superwash stretches like crazy as soon as it gets wet and it likes the dryer. Thanks for that advice! Im shortening the collar and then Ill try the dryer for the circumference. I hope it turns out, because it will be so beautiful.